I love this - what a perfect spring meal! I was reading your engagement post on Posie Gets Cozy and hopped on over to your blog. Love it! Yum. I love potato salad. in a few weeks i'll have more hard boiled egg than i know what to do with. this recipe will come in very useful. Misti-- Glad you found something you like here! 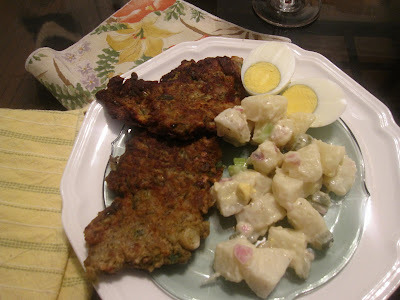 Stephanie-- Potato salad is about the best comfort food, isn't it? So melty and creamy and satisfying. Suna-- I was thinking this ended up being a timely recipe. It'd look pretty next to a big pile of dyed eggs, too. all i have to say is YUMMMMMMM!!!! you have such great ideas!! and by the way... i miss you!!! it has been to long since i last saw you! i hope all is well in the Strain residence! love you!